ISLAMABAD, Oct 22 (APP): All Parties Hurriyet Conference has flayed the puppet administration for terminating several government employees for participating in the ongoing protests against the civilian killings by Indian forces in the Kashmir Valley. 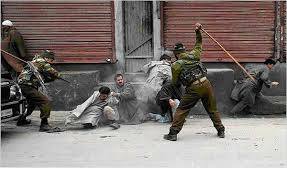 The APHC spokesman in a statement issued in Srinagar termed the action as revengeful and inhuman. “It is most unfortunate and undemocratic to punish employees just for raising their voice against atrocities on people,” he said, KMS reported. The spokesman said, the employees are part and parcel of Kashmir society and how can they be aloof and silent to the happenings around them “Every Kashmiri is not a commodity for sale as the stooges are, so how can anybody expect them to shut their eyes and plug their ears on the scourge in their vicinity” he said. The APHC spokesman said that everybody had a moral right to raise his voice against the excesses and if employees had stood against the tyranny and vandalism by the state machinery, they had not violated any law. “It is surprising that police accuse these employees of having participated in protests and stoning the so-called security forces, but it is ironical that those who killed over 100 people, blinded about 250 innocents and injured more than 15,000 are roaming freely,” the spokesman said. Meanwhile, the APHC spokesman said that Indian police were forcing the youth to attend police stations for their role in protests of 2008 and 2010 to harass them so that they would succumb to their pressure.